Following Several Deadly Bus Accidents, Are Your Children Safe? Home » Blog » After Several Deadly Bus Accidents, Are Your Children Safe? In a three-day span at the end of October, several children were injured or killed in school-bus related accidents. These crashes occurred in Mississippi, Indiana, and two Florida cities. In Pennsylvania, authorities reported that a driver hit a 7-year-old boy while he was waiting at the bus stop, and the driver sped off without helping. According to the National Highway Traffic Safety Administration (NHTSA), 1,313 people were killed in school transportation-related accidents from 2006 to 2015. Over 100 of these victims were classified as school-age pedestrians. Sixty-four percent of the children that were killed were hit by a school bus. Shouldn’t my child wear a seat belt on the bus? School buses are designed differently than normal passenger vehicles. NHTSA found that the best way to give crash protection to passengers in large school buses is through a concept called “compartmentalization.” This engineering technique provides extra protection for occupants who may not be wearing seatbelts. However, compartmentalization is not perfect, and seat belts are still recommended by NHTSA and the National Transportation Safety Board (NTSB). How can bus stop accidents be prevented? Many hit-and-run accidents with child pedestrians happen at school bus stops. Your child should arrive at the stop at least 5 minutes early, and they should be a few feet away from the curb while they wait. Your child should wait until the bus comes to a complete stop before getting on, and he or she should never walk behind or cross in front of a moving bus. Are bus drivers liable for bus accidents? Bus drivers should receive proper training on how to safely back out of a driveway and drive in school zones. Drivers are also required to follow all school bus laws, including flashing the correct lights and extending the stop arms to alert other drivers. Depending on the circumstances, a bus driver could be liable for an accident. 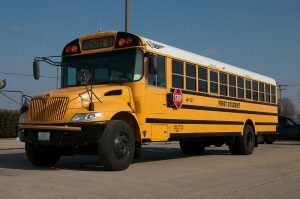 If your child has been injured in a school bus accident in Pennsylvania, your family could recover compensation. Contact the Pennsylvania bus accident attorneys at the O’Donnell Law Offices today for a free case evaluation.